When it comes to eating healthy, Cooper Clinic recommends a food-first philosophy. However, dietary restrictions and hectic lifestyles can often keep us from getting the nutrients our bodies need. 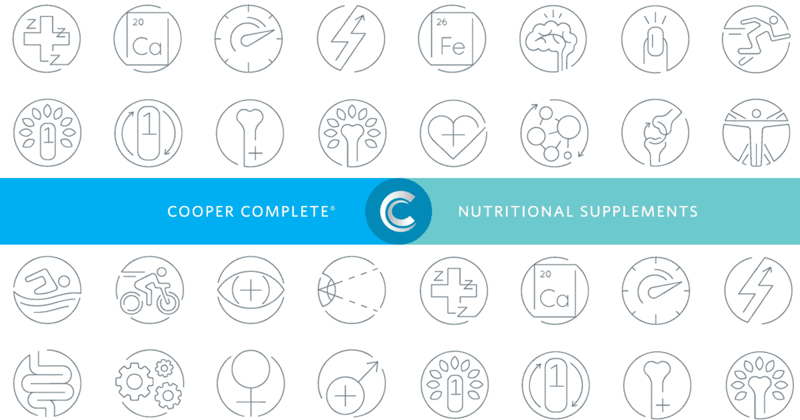 Cooper Clinic Nutrition Director Katherine Nashatker poses four questions to ask yourself to help determine if you’re getting enough nutrients through your diet alone and if not, what supplements might be best for you. 1 – Do you eat all five food groups? Eating healthy amounts from all five food groups is important for a healthy diet. When you portion your plate daily, does it include food from all five food groups? Some diets exclude food groups such as dairy and whole grains (Paleo Diet®) or meat and poultry (vegetarian diet). Because of this, eating healthy can be challenging when trying to meet the daily recommended intake of key nutrients. “Keeping a journal of what you eat can help you determine if you’re consuming enough vitamins and minerals from your diet,” says Nashatker. Nashatker says eating fatty fish twice a week in a portion size close to that of an iPhone (7-12 oz.) can give you 2,000 mg of omega-3 fatty acids. This daily recommended value is heart-health approved by both Cooper Clinic and the National Cholesterol Education Program. Supplement recommendation: If you follow a vegetarian diet or are not eating the recommended amount of fatty fish, taking an omega-3 supplement and multivitamin can help. Cooper Complete’s Healthy Body Pack provides both in a small, convenient pack. 2 – Do you drink coffee or tea? “For every yin there is a yang when it comes to adequate nutrient absorption,” says Nashatker. In other words, eating too much of one food can sometimes counterbalance the absorption of another. For example, tannins, can inhibit iron absorption from other foods such as beans, nuts and seeds. Tannins occur naturally in coffee, tea, and other dark-colored drinks. If you consume a lot of coffee or tea, Nashatker recommends pairing beans, nuts and seeds with vitamin C-rich foods such as oranges, red peppers, papaya and broccoli. This can enhance a person’s iron absorption and counterbalance the tannin intake. Supplement recommendation: If you’re not getting enough vitamin C to counter balance tannins, taking a vitamin C supplement may help. Cooper Complete Original Multivitamin Iron Free or Basic One Multivitamin Iron Free also provide a great dose of vitamin C. Taking vitamins with a meal rather than an empty stomach increases the body’s ability to absorb these nutrients. 3 – Do you get enough calcium? Eating healthy also involves eating regularly. Skipping lunch and waiting until dinner is unhealthy and inhibits your body’s ability to stay well nourished. Eating healthy calcium-rich foods in your diet can help ensure your body is properly fueled. Nashatker says calcium is best absorbed when taken in amounts of 500-600 mg or less. To give you a frame of reference, there are 300 mg of calcium in one cup of non-fat milk. “In the case of calcium-rich foods such as milk, cheese and yogurt, it’s best to space these sources throughout the day,” explains Nashatker. Supplement recommendation: If you’re lactose intolerant or don’t consume the recommended daily amount of calcium, try Cooper Complete Calcium Citrate. Each tablet provides 250 mg calcium taken up to twice daily. 4 – Do you have celiac disease or have you undergone gastric bypass surgery? “People who have celiac disease or have had gastric bypass surgery are more at risk for developing nutrient deficiencies, as both can impact the absorption of food,” says Nashatker. Why? The lining of the intestines contain villi, which help absorb nutrients. When people with celiac disease eat foods containing gluten, their immune system damages the villi, making it unable to properly absorb nutrients. Those who have had gastric bypass surgery may also struggle with absorbing nutrients from food. Making the stomach smaller during surgery can result in a decrease in production of hydrochloric acid. This directly affects the absorption of calcium, iron and other nutrients. Some medications such as antacids or lipase inhibitors can also impact the absorption of nutrients such as vitamin B12 and vitamins A, D, E and K.
Supplement recommendations: If you’re on acid blocking medications, have celiac disease or have undergone gastric bypass survey, it’s important to discuss possible supplement recommendations with a doctor. Taking vitamin B12 and a multivitamin may help make up for deficiencies. If you’re not getting your daily recommended nutrients through your diet alone, consider speaking with a registered dietitian nutritionist who can help you determine and then implement changes you might need to make.